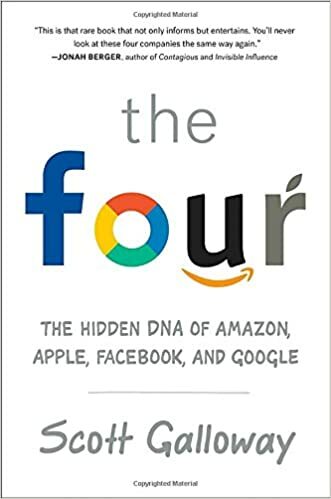 "Scott Galloway is the author of The Four: The Hidden DNA of Amazon, Apple, Facebook, and Google. He talks with Jason Howell about how Apple became a luxury brand, why Amazon is so addictive, what makes Google the new god, and why Facebook should be shut down." so it's never been easier to be a billionaire never been harder to be a millionaire "
"Amazon, Apple, Facebook, and Google are the four most influential companies on the planet. Just about everyone thinks they know how they got there. Just about everyone is wrong. ...How did the Four infiltrate our lives so completely that they’re almost impossible to avoid (or boycott)? Why does the stock market forgive them for sins that would destroy other firms?" "The tech giants now who frame the workings of so much of our lives – Facebook, Google, Amazon, Apple – have a range of reach beyond the industrial giants of the past. Into the most intimate corners of our lives. Across a huge spectrum of commerce, inquiry and communication." "Security researchers disclosed a vulnerability in the Wi-Fi protocol that could cause problems for smart device owners. The details of the KRACK vulnerability:"
It affects WPA2 Personal and Enterprise, regardless of the encryption ciphers used by a network. It mostly affects Linux and Android 6.0 and above, as well as macOS and OpenBSD. Windows and iOS are more or less unaffected due to the way they implement WPA2. Gadgets from Cisco, Linksys and other networking gear makers are also vulnerable. " "The long short of all of this is: you're definitely affected in some way, it just depends on which devices you use as to how to protect yourself. The most important thing to do is check if all of your devices can be patched immediately: not just your router, but whatever you're using to get online too." "Secure WiFi is broken - Dr Mike Pound & Dr Steve Bagley on the Krack Attack discovered by researchers in Belgium."